Black Bass Lake spillway in the fall. Photo by local Eureka Springs photographer Edward C. Robison III. The Spillway at Black Bass Lake -this cascade is actually the spillway for Black Bass Lake located on Oil Spring Road off of Highway 62 in Eureka Springs. You can drive right up to it. Tanyard Creek Falls– this 12 foot tall waterfall called Tanyard Creek Falls is found along a very scenic trail in Bella Vista off of Lancashire Blvd. Bella Vista is just a scenic 45 minute drive from Eureka Springs. Get there with this map. Tea Kettle Falls– a 46 foot tall waterfall, Tea Kettle Falls runs from a hole in the rock that the water has drilled over many years. Tea Kettle Falls only runs during high water periods. To get there, take Highway 23 South from Eureka Springs past Highway 12 about 1.5 miles and turn onto Road #447-8. Park in the field before you cross Warm Fork Creek and walk downstream for about 1.3 miles to the falls. Eagle’s Nest Falls– a 41 foot tall waterfall, Eagle’s Nest Falls pours into a grotto from the Kings River. To get there from Eureka Springs, drive south on Highway 23 until you pass Highway 12 and turn onto CR#1250 (a gravel road). Look for Madison County Wildlife Management signs. Turn left at #447-19 for .3 miles and park past Camp Area #14. Hike the road and after you cross the third stream, turn right through the woods about 200 feet to the creek. There are many waterfalls in the Buffalo River Region. The best way to find them is to located one of the great guidebooks. 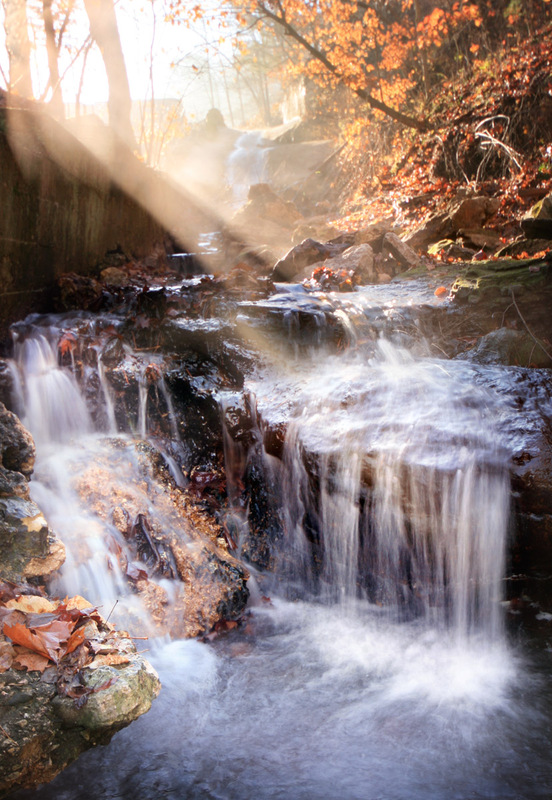 Tim Ernst, a local photographer, listed 133 waterfalls in Arkansas Waterfalls Guidebook. Looking for something to do in Eureka Springs? EurekaSprings.com shares monthly newsletters packed with things to do and last minute Eureka Springs lodging deals. Sign up for the EurekaSprings.com newsletter today. Like the photo in this post? See more of Edward C. Robison’s work at Sacred Earth Gallery.